After a post-season holiday lull, BTFC transfer activity has kicked into action with a vengeance. In the past week, fans have had three exciting new signings to contend with. 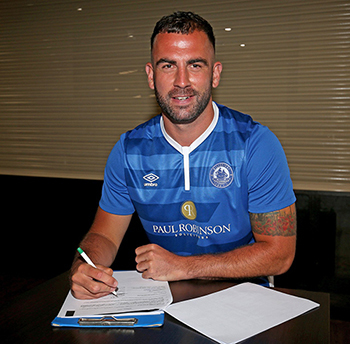 Today, the Blues announced the arrival of midfielder, Simon Walton, from National League side, Sutton United. Last Thursday, the arrival at the AGP of centre-back, Rickie Hayles, from Dulwich Hamlet, was confirmed. 24 hours earlier, former AFC Wimbledon left-back, Callum Kennedy, signed a two year contract with the Blues. So far, we have five new arrivals coming into the BTFC squad, vintage 2018/19. These include commanding centre-back, Joe Ellul, returning to the club, after spells at Braintree Town and Maldon & Tiptree. Pacy, right-sided wide-man, Connor Hunte, also joins, choosing to move to BTFC from Greenwich Borough via Kingstonian. With 10 players retained from the last campaign (see list below), the club are making good progress in establishing a mix of the “tried and test” with some promising new faces for the challenges ahead in National South. Starting with our latest addition, Simon Walton, 30, is a former England U-16, U-17 & U-19 international. He signed from National League side, Sutton United, but comes with extensive League experience. He began his career at home-town club, Leeds United, where featured in the Championship. At that level, he also played at Ipswich Town, Cardiff City and Hull City. Simon’s longest stay was at Plymouth Argyle, where he spent four years before leaving in 2012. Since then, he has appeared regularly in League 2 (Hartlepool United, Stevenage, and Crawley Town) before moving into non-League last season. At home in central defence or midfield, Simon’s best position is in the central midfield holding role. With a reputation as a strong tackler with excellent passing range, he was likened to David Batty in his younger days at Leeds United. We think Simon’s vast experience represents a further step-up in class within the BTFC midfield and gives us valuable defensive cover alongside Danny Waldren and Matt Paine. Rickie Hayles is a very familiar name to most BTFC fans since he played at the heart of the Dulwich Hamlet defence last season. Rickie offers strong leadership, aerial presence, and enhances defensive solidity. He has extensive Non-League experience having spent his career in either the National South or playing for sides at the very top of the Bostik Premier equivalent. Something of a play-off specialist, Rickie has won promotion to Step 2 on three occasions (2011/12 Hornchurch; 2015/16 East Thurrock; and 2017/18 Dulwich Hamlet). Well-known to many of the BTFC lads, he resumes a defensive partnership with Joe Ellul and renews acquaintance with former Welling team-mate, Danny Waldren. Callum Kennedy, 28, comes in to BTFC as a specialist left-back after his contract ended at his previous club. With League One experience, Callum is an experienced performer, impressive passer, and good free-kick taker. Keen to get forward, he offers options within a back four or as a wing-back. Starting his career at Swindon Town, he played for Paulo Di Canio during his five years at the club. After one season at Scunthorpe United, he spent four years over two spells at AFC Wimbledon split by a season at (then) League Two Orient. He is best known, however for his assist on the first goal in Wimbledon’s 2016 play-off final victory. The 2-0 win v Plymouth Argyle saw the club promoted to League One. 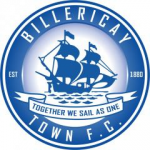 News of Joe Ellul’s return gave everybody a lift at Billericay Town. A firm fan favourite and just the guy you’d like to have alongside when the going gets tough. Back for a third spell with the Blues, Joe, 29, represents a link between the past, present, and future of the club. A proven performer at National South level with Braintree Town and at East Thurrock, where he played as Centre-back alongside a certain Rickie Hayles. He offers strength, physical power, and strong aerial threat in both boxes. With Ellul, record-signing Inman, award winning Kizzi, and the experience of new arrival, Hayles, BTFC have a strong defensive base. Connor Hunte, 22, an ex-England U-16 and U-17 international, is a product of the Chelsea FC academy. He moved to (then) Championship side Wolves in the summer of 2014 and made several substitute appearances. After a short spell on loan at Stevenage, he began 2017/18 season at Bostik South side, Greenwich Borough. At Kingstonian, from November 2017, Connor featured regularly on the right-wing for the Bostik Premier outfit. To date, Connor has not made the most of earlier opportunities at big clubs but has battled back to impress with recent displays. Offering exceptional pace and ability to beat his man, he has promise. With the squad taking shape, and news of an exciting friendly V West Ham X1 at the AGP on Tuesday 31 July, there is plenty to look forward to for BTFC fans. Keep your eyes on the BTFC twitter feed and club website for more updates. We don’t doubt that the club are working on more exciting signings! Sam Deering/Ricky Modeste/Jake Robinson/Adam Cunnington. Joe Ellul (Maldon & Tiptree)/ Rickie Hayles (Dulwich Hamlet)/Callum Kennedy (Wimbledon)/Connor Hunte (Kingstonian)/Simon Walton (Sutton United). Jack Giddens (East Thurrock Utd), Liam Hughes (Darlington), Byron Lawrence (Dulwich Hamlet), Nick Wheeler (Woking), Olly Sprague (Hampton & Richmond), Josh Urquhart-McLeod (Hampton & Richmond).